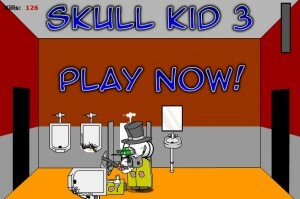 Skull Kid Games are a widely popular series of shoot-’em-up flash games. 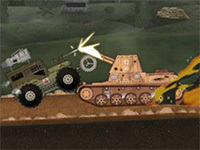 These games offer hours of fun and tons of excitement for children and adults of all ages. The hotkey controls in most Skull Kid games are pretty standard, and the entertainment level is through the roof! If you’re looking for a way to kill a few minutes of time, or want something that can entertain you for hours – Skull Kid games are right up your alley! 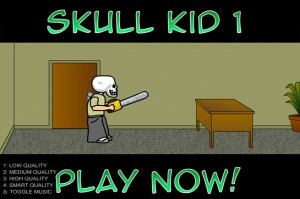 Skull Kid 1 is a very basic game that is fun to play when you only have a few spare minutes. You play as Skull Kid, who is sick and tired of being treated poorly in the office where he works, and decides to do something about it. Your weapons of choice are a chainsaw and a pistol. Help Skull Kid destroy the office, and everyone in it, then teach that no good boss a permanent lesson. Skull Kid 2 is more complex than its previous version. Similar to the last version, you play as Skull Kid – a very mad kid who has decided to take his aggression out on the thugs and gangsters on the streets. 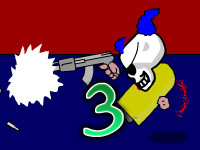 This version offers players many more levels to complete, tough challenges to overcome, a lot more hotkey controls to learn, additional modes to play, and, of course, lots of blood to shed. Due to the complexity of this game compared to its earlier version, it is advised that new players being playing in the tutorial mode to learn some of the basic concepts and hotkey usages of the game. This will help ensure your success throughout the game. Skull Kid is back and more difficult than ever! 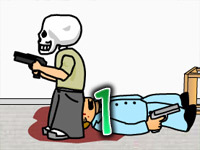 Your name has become famous after you’ve taken down every gangster and thug on the streets in the previous version of this game, and you’ve now accepted a new job – and one you enjoy even more than that silly office job. You’ve been recruited by a very powerful man. He’s given you a task to kill a list of people on his hit list. 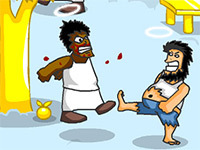 In return, he will give you a large sum of money for every head you collect. See if you have what it takes to become the next best assassin in the world. Skull Kid 3 features a different game style. In this version, you’re on a quest to locate and kill multiple targets that your employer has asked you to take care of. 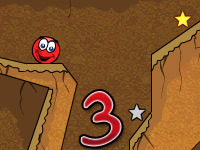 It features many more levels than previous versions of the game, and includes multiple quests for you to complete – each quest and level are more challenging than the last. In addition to this new gaming style, you also have the ability to purchase items in the game shop to help you along your quest. 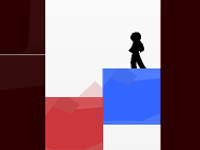 After completing a certain number of levels, you’ll be given the opportunity to play in a bonus level. Completing the bonus level will unlock many new achievements as well as fatten up your wallet even more. ©2019 Skull Kid 2. All rights reserved. 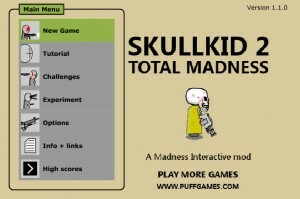 Skull Kid is a trademark owned by Chance & puffgames.com. This website is not endorsed by or affiliated with Chance & puffgames.com in any way.